"Three Ravell daughters". 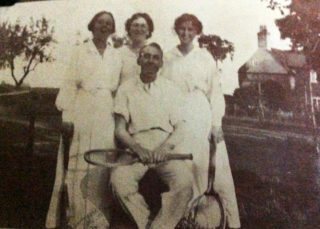 Probably taken in the 1920s in the tennis court at Normanton House. "The Ravell farmhouse at Normanton". This is known today as Normanton House, on Normanton Lane. From the collection of John Michael Shaw. 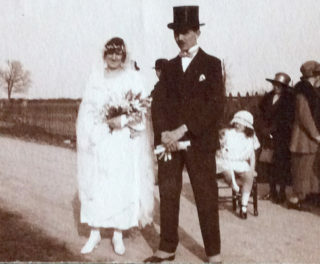 "Minnie Ravell wedding to Edward Shaw in 1923". Taken after the wedding as the party made their way along Normanton Lane from Bottesford church to Minnie's parents' home at Normanton House. 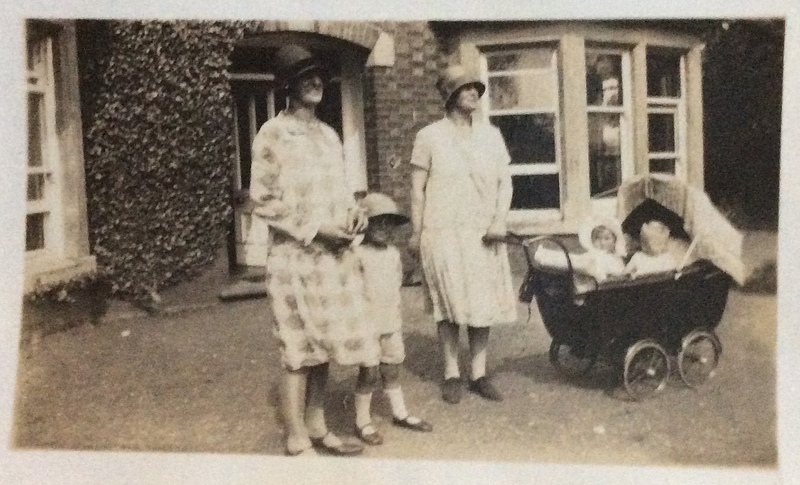 "Minnie Shaw, Agnes Toynbee Clarke and offspring. I (John Michael Shaw) am the good looking one in the pram". Circa 1929, location uncertain. 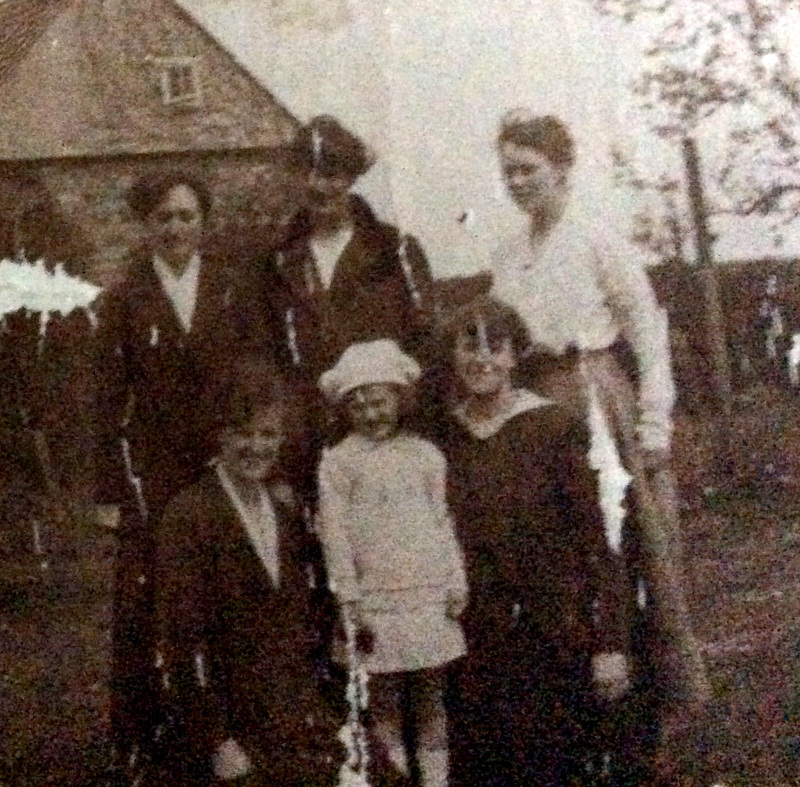 "Family group in orchard at Normanton." A copy of the photograph displayed in the club room of Bottesford Bowls Club, Belvoir Road. 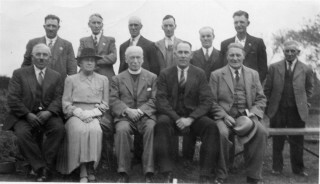 The occasion is the opening of the Bowls Club in 1947/1948. John Thomas Ravell is standing, third from the left. Edward (Ted) Shaw was born in Barrowby, near Grantham, on the 7th June 1899, and his birth was registered in Grantham. He was the eldest child of Sidney Shaw, born in1874, and Bessey May Sparkes, known as May, who was born 1877. Edward’s father, Sidney, was the son of John Shaw, a leading businessman in Grantham. John and Alexander Shaw owned Shaw’s Tannery in Grantham. John Shaw and his seven sons, including Sidney, all worked for the family business. The tannery was located by the canal on Earlsfield Lane, Grantham. According to the 1901 Census, Edward, age 1, appears to be staying with his grandparents Sidney and Bessie Sparkes in Lincoln. Sidney Shaw and his family left England in 1909, and by 1911 they were living in Buenos Aires  , so there is no record of them in the 1911 census. They returned to England around 1912, and were recorded as living in Bottesford in 1918. An article in the Grantham Journal describes a social event in 1918 arranged by Sidney Shaw at his home in Bottesford to show management appreciation for his tannery employees. Sidney was described as the General Manager. The article described the introduction of a profit sharing scheme for employees and commented positively on the Company’s policy of considering the interests of workers before shareholders. This was very innovative in its day. Edward Shaw enlisted for the RAF on 6th May 1918, a mere 5 weeks after its creation on the 1st April, 1918. His record sheet exists and his service number was 164409. Aged 18 years and 11 months, he was described as 6ft. 1⅞ inches, with brown hair, brown eyes and a fresh complexion. His civilian occupation was described as a fitter. His next of kin was his mother May Shaw, living on the High Street, Bottesford. His war experience was mostly training. He was first posted to the RAF Depot at Blandford, which was an intake camp, and he then transferred to the School of Training at Halton Camp on the 19th May 1918. Halton was the main training camp for mechanics, and permanent workshops were constructed for the many trade specialities – it was also known as “The School of Technical Training”. Edward then returned to the RAF Depot at Blandford before moving on to the Training Depot Station (TDS) at Eastchurch on the Isle of Sheppey on the 20th November, 1918. This was the base for the 204 squadron and had formerly been the Royal Naval air station. Each TDS was specialised and 204TDS was producing scout pilots. However, on 29th January 1919 Edward was moved to Clipstone, near Mansfield, which was a large army camp that was used to process demobilisations. Three weeks later, on the 27th February 1919, he was demobilised and officially moved to the RAF B Reserve. There is a note on his record sheet stating that his casualty card was destroyed on 4th February 1921. This often occurred when the casualty card was blank. Unlike army personnel, there are no Medal Index Cards for airmen who served in the RAF at this date. The only record of medal details is on the individual airman’s service record sheet and there are no medal details on Edward’s record. There is an RAF muster roll, but Edward Shaw, service number 164409, cannot be found on it. This may be because he was training and not attached to a specific squadron/unit until after the war itself had finished. Edward continued as a motor mechanic, eventually owning a garage in Meopham, Kent. He married Minnie Ravell from Normanton, Bottesford, in Bottesford Church on the 21st March, 1923 . At this time he was described as a motor engineer, living in Highbury. In the marriage announcement in the Grantham Journal it stated that he was the son of Mr & Mrs S. Shaw of Leeds. His parents had moved and left the family business in Grantham, which went into liquidation in October 1923. Soon afterwards, Sidney and May Shaw moved to Sutton on Sea. There are some back to back streets in Leeds called Highbury Road/Mount/Terrace/Place, however it is unclear whether the Highbury on the wedding certificate refers to this area or to Highbury in London. 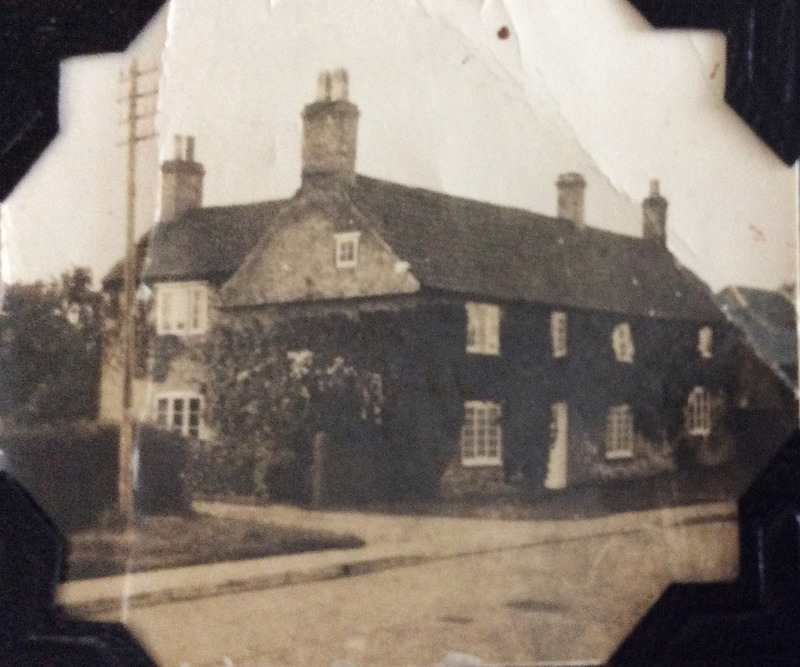 After the wedding Ted and Minnie went to live in Meopham in Kent. They had two sons – Edward Anthony Ravell Shaw, known as Tony, born in Strood, Kent in 1924  and John Michael Shaw, born in Gravesend in 1927 . Unfortunately, Ted left Minnie and the boys. She initially went to live with her sister Liz and her husband Fred Lenton in Danby House, Normanton,  then, after the marriage had broken down, she went to work as the Matron at the Modern School, Salisbury, until 1942, where both sons were educated . No medals known to have been awarded. Service career shortened by the ending of the war: he enlisted in May 1918, was posted to 204 Squadron late in November 1918 after the armistice, then was demobilised in February, 1919.